Even though I don't TA at SFU anymore, I've still continued the tradition of bringing sushi trays into my office every so often and sharing them with my office mates. Just to keep things interesting, I try not to bring the same trays over and over again, but there are only so many places that are close enough to SFU that the sushi doesn't get cold on the ride there. Production Station is only a 10-minute bus ride from SFU, but the previous sushi restaurant at the station, Sushi Kaku, was so dead and uninviting that I had second thoughts about going in. For the record, I don't have second thoughts about bussing home from a party at 3 a.m. from one side of GVRD to the other, so that says much about the restaurant. 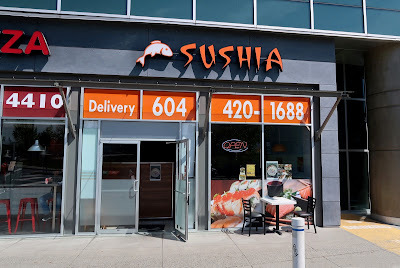 The new sushi restaurant at Production Station, Sushia, looks a lot more inviting, and I strolled in to see if it was a worthy candidate for my party tray adventures at the office. Sushia is a Chinese-operated restaurant that seats about 25. The prices were rather reasonable, and business appeared to be healthy, with a steady stream of take-out orders and eat-in diners. 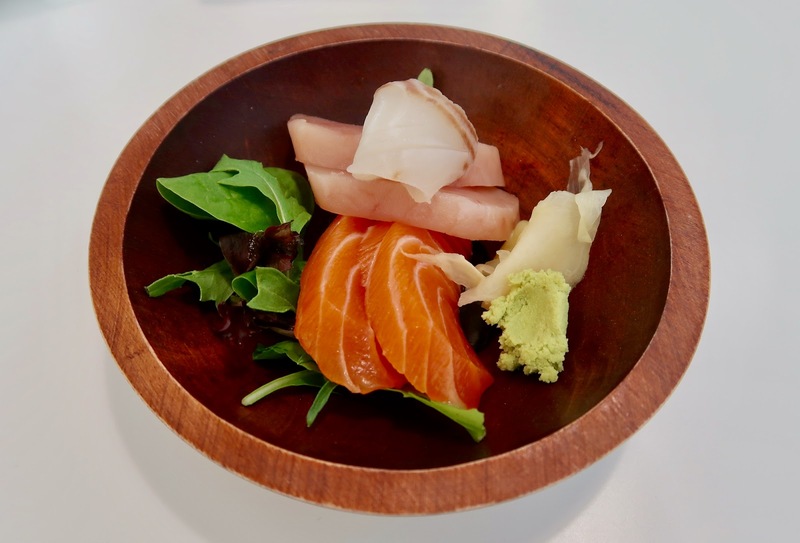 The menu is quite large for a restaurant of this size, with a good assortment of appetizers, special rolls, rice/noodle bowls, nigiri, sashimi, and the new, trendy favourite—oshi sushi. 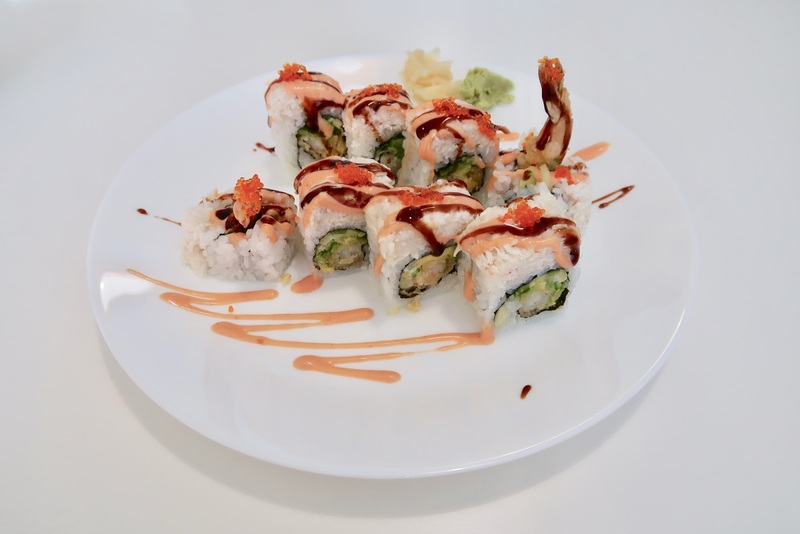 The Ocean Roll consisted of prawn tempura, cucumber, avocado, imitation crab meat, and tobiko. It came in small but neatly constructed pieces, and the sauces (spicy mayo and unagi sauce) provided ample flavour to the roll despite the roll being slightly rice-heavy. The tempura batter, however, was really hard, and the rice vinegar was too strong, interfering with the sweetness of the imitation crab meat on top. The Appetizer Sashimi, which came with 2 pieces of salmon, 2 pieces of tuna, and 1 piece of tai, was also presented neatly, with a small salad underneath. The salmon was pleasantly buttery and smooth, and the tai (snapper) was fresh with a delectable, sweet flavour. I also liked how the tai was not tough at all. However, I did not like the tuna, which was not soft at all and inexplicably dry. I wanted to try the Toro Oshi, but since they ran out of toro, I opted for the Unagi Oshi instead, which was the lunch special of the day (a $2 discount off the regular price). I was initially puzzled as to why there would be a random slice of lemon on my plate, but as soon as I bit into the oshi, I could see why. 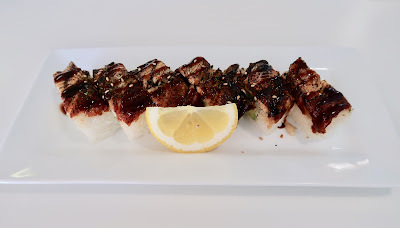 The unagi was overdone (with some burnt parts), and the lemon was required to give the unagi its necessary juiciness. At least the rice was not too tightly packed, and the creamy avocado inside prevented the rice from feeling too dry. 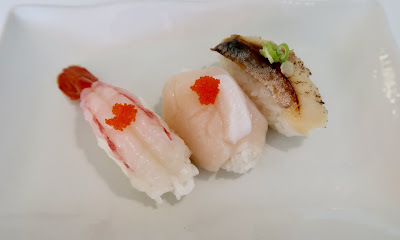 The Amaebi Nigiri did not disappoint, with deliciously sweet and creamy shrimp that had a light chew and a good rebound. The Hotate Nigiri (scallop) was moderately fresh, with a slight overage of rice underneath. However, the one piece that really disappointed was the Saba Nigiri, which was so dry and salty that it might as well have been labelled Dried Anchovy Nigiri. I experienced friendly service during my visit, but the food was very hit and miss. 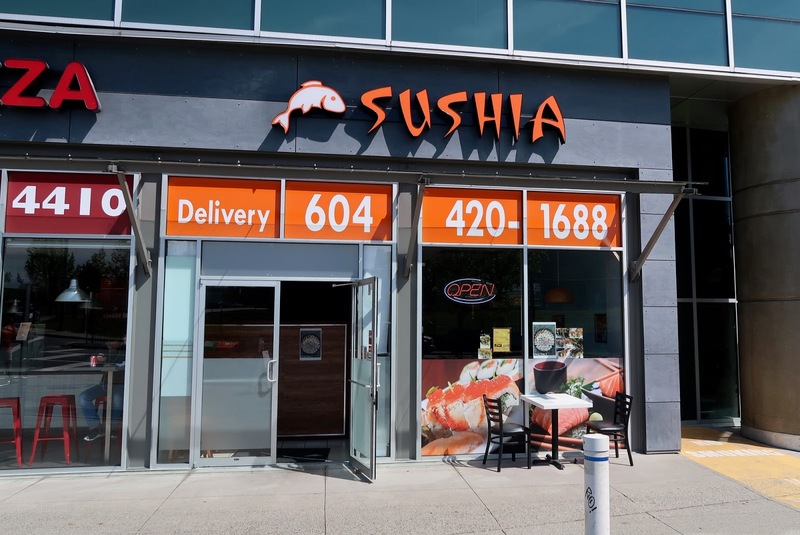 They are able to stock fresh seafood and have some appealing menu items, but the consistency will have to improve before this restaurant can attract the vast population of students commuting to SFU. In the meantime, I'm sticking with my top picks on Hastings (Take, Kilala, and Osaka) for my party trays.